The Garfagnana is one of the most famous 'undiscovered' parts of Italy. It's a large area of valley and mountain north of Lucca and Pisa, in the northern part of Tuscany. Although mostly rural and little affected, so far, by tourism, the Garfagnana has been creeping onto the itinerary of more adventurous tourists for some years. Like much of rural Italy, it has links - through emigration - to faraway places, in this case chiefly to Britain and especially to Scotland. 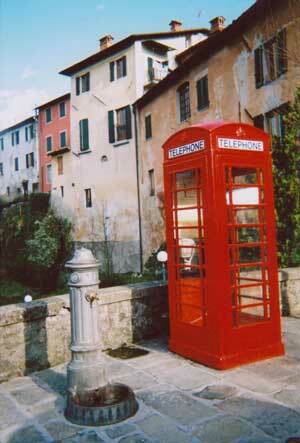 The small town of Barga, though hardly a capital, is the closest to becoming a tourist hotspot. From the northern end of the Garfagnana, the river Serchio winds roughly parallel with the coast for 30-odd miles (50km) down to Lucca. There is some industry on the flatter valley bottom but the sides generally run up quite swiftly into a patchwork of woods and farms with their own network of tributary streams. The skies are broad, because the summits of the mountains lie well back. On the east side these mountains form sweeping ridges typically 4-5,000 feet (around 1,400m) above sea level. On the western side - between the river and the coast - they are more aggressively shaped, attain well over 5,000 feet (1,500m) and have taken the title "Apuan Alps". Their upper reaches are green pasture and white limestone: they have been massively quarried (mostly on the farther side) for the marble prized by Renaissance architects and used for graveyard memorials ever since. Until the 1400s, the area was under the sway of Lucca, the source for its art and culture and the destination for any local agricultural surplus (there would not have been much) as well as timber, stone and the product of its mines. Other powers held the Garfagnana subsequently, without much affecting the normal course of affairs. An industrial tradition has remained part of the the picture, chiefly along the riverbank southward from Barga. The largest towns in the region are Barga and Castelnuovo di Garfagnana, but settlement is mostly a matter of small and scattered communities, whose orchards, vineyards and grazing lands are separated by oak and chestnut forest. Its attractions for the tourist - landscapes, picturesque villages, churches and castles - are many but widely dispersed. Garfagnese winters are cold. Unless you go there for the limited skiing facilities of the Apuan Alps, the best time to visit the Garfagnana is either the spring, when the trees are in young leaf and the mountaintops still streaked with snow, or autumn, when all colours converge to bronze and gold. Summertime is also a possibility, as travellers may find respite from the boiling cities. Enterprising drivers might find a wriggly way into the top end of the Garfagnana from near La Spezia or attempt (though not in winter) to cross the Apuan Alps from the coastal autostrada, but the simplest approach remains via Lucca. Even from there the route is fairly congested for several miles, and, although there are some good fast stretches later on, the road still has to follow mostly the windings of the river. Public transport connections are sparse, but a few buses a day run rather laboriously out from Lucca to Barga and Castelnuovo. Trains operate, also a few times a day, right up to the head of the valley, finally burrowing through the hills to join a line inland from La Spezia. This is not a "Chiantishire" part of Tuscany, scattered with alluring cities and smart restaurants, decorated with villas and cypresses. No such hedonism. As we've already implied, the Garfagnana is more suited to the explorer-motorist, or to the healthy-mind-in-a-healthy-body lifestyle. Regarding maps, the green and yellow Touring Club Italiano series (preferably 1:200,000 sheet) is as good as any for driving about with, but you should go for Kompass map 0646 (1:50,000, showing footpaths) for more detailed use. We also discovered, on the back of a leaflet "Grotta del Vento" ("Cave of the Wind") picked up in Lucca, a short description in Italian, English, French and German of twenty-five attractions, along with a key to show their location in the Garfagnana. If you can get hold of this or similar tourist material, we'd recommend it. 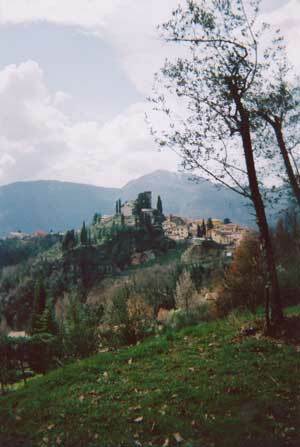 Barga and Castelnuovo are possible bases, both being small - very small - towns, medieval, with walls. Barga involves a shorter journey from Lucca while Castelnuovo has the advantage of a castle and a market (Thursdays). The Garfagnana is a reasonable destination for activity holidays. There's a little skiing and snowshoeing in winter and early spring; cycling and horseriding later in the year. Possibilities for serious caving exist in the Apuan Alps, along with one or two show caves. Strong walkers can find big and windy routes in both mountain ranges, where there are alpine flowers. Before they come here, however, hikers should be aware that this is not the Alps. There is no centre from which footpaths radiate up to roadless heights. Both valley sides are well settled, with little lanes and dirt roads. These are good material for cyclists, and one can improvise pretty and scenically eventful strolls among them, but will sometimes wonder whether a route goes through, or is only for private use. In most of Italy the concept of public footpaths is not particularly useful. Here, the marked footpaths run chiefly higher up. The best solution is either to use a car for access or to join a group in which guidance and local transport are laid on. Several firms who specialise in activity holidays lead walking weeks in the Garfagnana, graded from easy to moderate. The CAI - Club Alpino Italiano - also lead day-walks here and their walking programme should be available from tourist information offices. This is an excellent organisation, which covers hiking as well as true mountaineering, and publishes maps in a country which gives little official priority to doing so. As well as a handful of hotels, the Garfagnana area offers bed and breakfast accommodation and also the option of staying in an agriturismo, a farm-stay.